Every spring, the melted snow fills the riverbeds, opening the way back home for the salmon after a life swimming in the oceans. During their journey, they will face hungry bears, fierce birds of prey, and patient fishermen, all of which they must avoid in order to survive and make their way Upstream - all in a new abstract strategy game by 2Tomatoes Games. 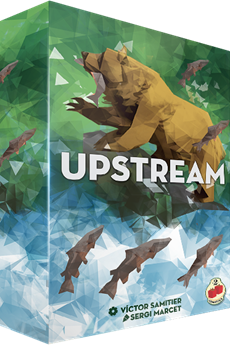 The game of Upstream is played in rounds, with each player spending five points among their salmon tokens in order to move them, either swimming or jumping across the hexagonal tiled river. At the end of each round, the lowermost pieces of the river are removed from the game, along with any salmon tokens standing on them, then three new tiles are added to the uppermost side of the river. The game ends when all salmon are either deceased or on the spawn point at the very end of the river. Players then score points, according to the number and order of arrival of their salmon. The player with most points wins.